To say that Chaos;Child has a strong start is an understatement. After setting the game’s world up (it takes place in Shibuya six years after a tragic earthquake had hit), it shows a familiar sight of a livestreamer trying to keep his audience’s attention. Everything seemed very grounded in reality until I saw the dude cut off his own arm without any sense of pain, and then start eating it much to the horror of his audience. That was when I knew I wasn’t in for a typical visual novel. After watching another unfortunate person die in a mysterious way, the game introduces its main cast of characters: a bunch of high schoolers that are a part of their school’s newspaper. Despite the murders happening relatively close to them, they’re naturally fascinated by them. After all, it’s a gigantic mystery for them to chase in their own city, and the chance of a lifetime for an aspiring journalist. They start trying to track down these murders, and it’s all fun until things wind up hitting too close to home. There’s not much in terms of gameplay for Chaos;Child. There are the occasional deduction that the player will be forced to make, but they’re all quite obvious and aren’t difficult to do correctly. There are some bad endings associated with picking the wrong ones, but thankfully there’s a great auto-save, so it’s not like the player is ever going to lose progress due to a misstep. There’s also a series of delusions that occur, where the player can either approach a situation positively or negatively. Depending on what they choose, they’ll see a small daydream that’s often highly humorous in nature. The positive ones tend to be highly sexual (since where else would a teenage mind wander? ), but thankfully these light-hearted elements are gone by the time the story really picks up. One of the reasons why Chaos;Child is able to have such success in its narrative is that the strong writing is accompanied by some really fascinating characters. While many of the characters may fit into an “anime archetype,” they all have layers of complexity beneath their simple exterior. Everyone has depth, and the story does a great job of making sure the player wants to find out more about all of the cast. The most interesting character, though, winds up being the main protagonist, Takuru. What makes Takuru such an interesting lead character is that while I’m sure a number of readers will relate to him as he rants about a large portion of society being terrible, he’s undeniably the worst kind of dude. He’s constantly hoping that any interaction he has with a female student will turn sexual (even with his non-biological sister), and has an incredibly selfish viewpoint of only thinking about himself. 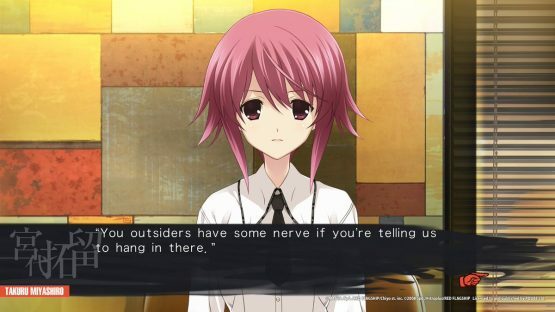 Thankfully, there is some growth during the events of Chaos;Child, and the game winds up having a pretty clear message about those that think so highly of themselves while looking down upon everyone else. Since I’m a huge fan of murder mysteries, I was a bit letdown when Chaos;Child stopped going down the detective route about midway through the story, and then went into a more supernatural direction. This isn’t much of a complaint, as the story is still strong throughout and the requisite clues are laid out so that it’s not much of a shock at all when players realize that they aren’t dealing with normal killings, but there’s definitely a shift in story direction that I enjoyed slightly less than the strong opening. Things manage to wrap up rather nicely by the end, and the supernatural elements wind up definitely adding to the overall mystery rather than taking away from it as I had initially feared. Considering Chaos;Child begins with a dude chopping up his own arm and then snacking on the pieces as if it was some Babybel cheese, it really surprised me that it managed to continually keep raising both the stakes and gross-out factor. Some of the directions that the game goes in is utterly horrifying. Normally you’d expect a small child to be clear from any sort of violence in a game, but that rule isn’t in play here. In fact, during the story players have to witness the end result of one of the most disgusting mutilations I’ve ever seen depicted in any medium, let alone a video game. I have to stress that this game is not for those with a weak stomach. Those who can put up with the horrifying sights and vivid descriptions are rewarded with a really thought provoking story, though. Considering how much of the story is about personal trauma, it’s almost fitting that players have to endure some rough imagery and situations to get their reward. 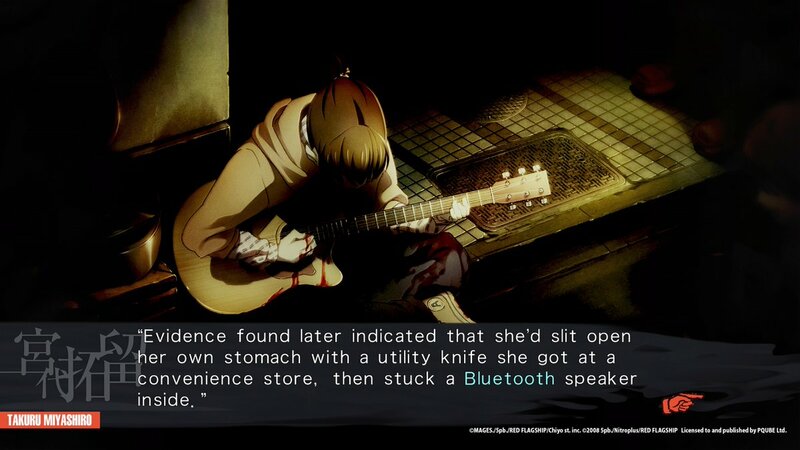 Since it takes place in a modern setting, Chaos;Child manages to use technology in some really smart ways. While it’s true that people have more information at their fingertips than ever before, it also makes it clear that this means the masses can also be more easily got to and manipulated. Through some brilliant writing, it manages to constantly make the player wonder if these advances are truly good for society as a whole. Beyond the imagery, there’s also one other things players have to endure, and that’s a pretty large amount of typos and general grammar errors throughout the game. It’s never distracting enough to have a negative impact on the overall experience, but there’s a lot of rough patches in the localization (such as one character showing up as “Unknown” way after the player finds out their name) that wind up being a bit of a distraction. Thankfully, the actual writing and translation is strong, it’s just the copyediting that could’ve used another pass. Chaos Child review code provided by publisher. Reviewed on PlayStation 4 Pro. For more information on scoring, please read our Review Policy here.